Hwasin advances to the Ro8 in the B2 slot. Savior advances to the Ro8 in the D1 slot. Flash advances in the D2 slot. The sheer number of games this week has forced me to skip my recap. It’s just not feasible to write summaries for eleven games! But if you want a general idea of what happened in each game, check out the live report thread. Credit for these videos goes to BaeZZi and yakii. All credit for this incredibly cool bracket goes to pachi. The quarterfinals follow a best-of-three format, with the first game of each series being played this coming week. The second and, if necessary, third games will be played next week. I like Up’s odds against Hwasin this week. Though Hwasin is still the favorite to win, Up’s unpredictability and generally strong strategic sense make him a dangerous TvT opponent on a tactical map like Persona. Katrina is a map that’s caused some balance controversy, but I believe these claims to be overblown. Still, Light’s propensity towards macro-centric builds could give him an edge over Jaedong on a map like Katrina. Light is my pick to win this game, whereas Jaedong is my pick to win the series. The MSL final for which everyone was hoping will have to take place in the OSL quarterfinals. Though Bisu recently showed his mortality against Mind, Bisu’s PvZ has looked far too strong for far too long for me to consider him anything but a huge favorite against Savior. The first game in the Bo3 will take place on Blue Storm. I’m concerned about Stork vs. Flash. Stork may have won their previous Bo5 with a perfect 3-0 record, but Flash “had” two of those games. He lost each due to deficient scouting. Beyond that, Flash has shown that he’s not afraid to use non-standard builds when the situation warrants it. Stork is still the heavy favorite to win, but Flash is a definite threat. Thanks for the report, very much appreciated although some analysis might have been interesting. The brackets are really tense though, no "pre-finals" like in MSL [Bisu vs. Hwasin, Savior vs. Stork with other matches being a lot less exciting] (of course Mind's victory has disproven this hypothesis, but still). Savior better come through, thats all I'll say. Then vs Stork then finals vs Hwasin or Jaedong would be great. what's the font used for the 4x terran 2x protoss, zerg, champion? i like. Goooooo Stork! I like his odds DJ, far better than you do. Bisu v Savior is the biggest final that one could realistically hope for right now especially out of these quarterfinalists and its rather premature at the quarterfinals stage. The pool of quarterfinalist this OSL is insane, I would be happy with anyone who has made it this far to win the whole thing. I'd be excited if it was the first sparks of someone new, or a reward for someone who has been working at it or even a lifeline to one of the falling greats. Jaedong will win his side of the brackets. And then theres a 50% chance of winning and losing in the finals. Either ZvZ vs sAviOr could win or ZvT vs Flash. He won't beat either of the protosses. 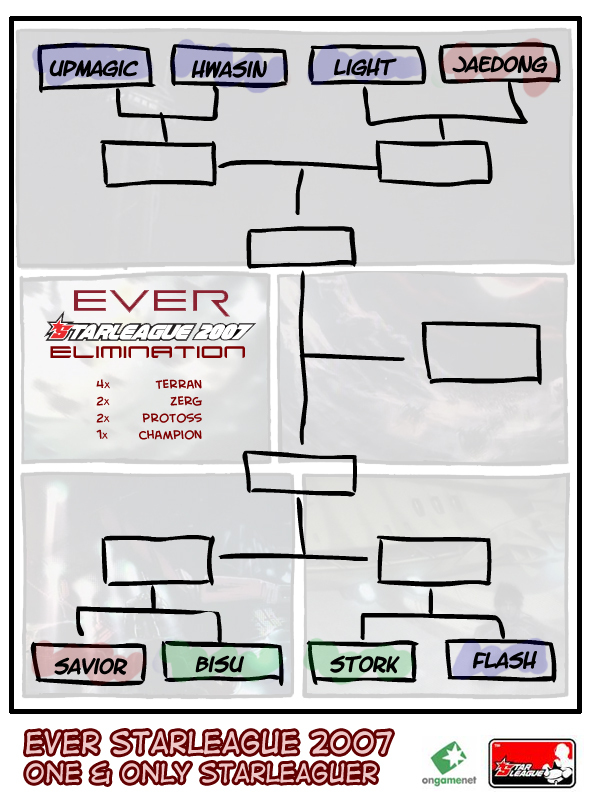 He better hope Flash or sAviOr overcomes, he's not ready to take on stork ZvP, let alone Bisu. Damnit, Stork and Bisu will meet again. If he can fend off Stork (and obviously, get to Stork/face Stork in the first place) however, this championship would definitely have Bisu as the favourite. both savior and bisu are pretty damn angry right now lols, eliminted by the same new face in the MSL, loser of this match will develop mental issues probably. I really liked that analysis.